Shoes for Back Pain, Foot Pain, and Joint Pain! Countless Americans are hampered by troubling pain, be it back pain, foot pain, joint pain, or others. The remedies are nearly endless, from creams, medications, and exercises, to ergonomic chairs, massage therapies, and even herbal remedies. Somehow, one of the simplest fixes lies right under our nose: our feet! 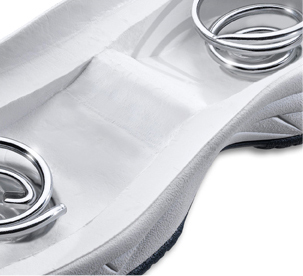 Here at SpringFlex®, our revolutionary shoes are engineered with springs in in both the heel and forefront – allowing them to flex with your foot as you walk. This creation imbues your body with an unequaled travel experience that is a great solution for pain in your back, foot, and joints. All SpringFlex® shoes are designed with breathable, top grade leather for the highest quality spring coil shoes. 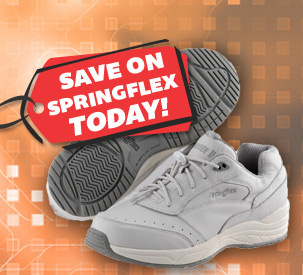 SpringFlex® shoes are designed for optimal support for those with an active lifestyle. Whether standing for long periods of time, working on your feet throughout the day, or heading out for a walk, comfortable shoes are a must. That’s why our shoes with springs offer superior technology than other spring loaded shoes. When it comes to coil shoes, the SpringFlex® coil spring technology is the best in the business. As a result, these are great shoes for back pain and foot pain and provide the perfect combination of comfort and support. Plus, each of our SpringFlex® shoes are designed with breathable, top grade leather that results in truly high quality spring coil shoes. At this point you may be wondering: What is the catch? How does this technology even work? Quite simply, in fact: our patented TrueBounce™ Technology – The Heart and “Sole” of our shoes™, absorbs shock and returns more energy with every step you take. In essence, these wonderful shoes reduce stress on the legs and pelvis, effectively preventing injury by easing the force of impact between you and the ground. As an added benefit, fatigue is substantially reduced, as our shoes provide higher energy return. Ultimately, whether you are one of the 65 million Americans suffering from back pain, or you are simply interested in upgrading the shoes you slip on each day – SpringFlex® shoes are here to help! Visit our blog and product descriptions for more information and take advantage of our online sale today!